There are two core (“Essentials” and “Primaries”) and three themed sets (“Marine”, “Floral” and “Nature”). All of the pencils sets have been designed to come in groups of three colour families, just like the Spectrum Noir alcohol markers – a light, a medium and a dark. This has been done specifically to enable the user to perfect light and shade techniques in their colour work. The pigment in these was-based blendable pencils is thick and rich, cased in comfortable luxe matte black hardwood. Our unique formulation allows for intense and soft colour from the same pencil. The Spectrum Noir Blendable Penvils range are an exciting addition to the Spectrum Noir family, with 120 pencils in total, divided into five 24-set pencil collections, along with accessories to help you get the most from your Spectrum Noir colouring. These was-based, blendable pencils are perfect for colouring lovers everywhere. Used on their own or combined with Spectrum Noir alcohol markers, a whole range of colouring possibilitlies can be achieved! 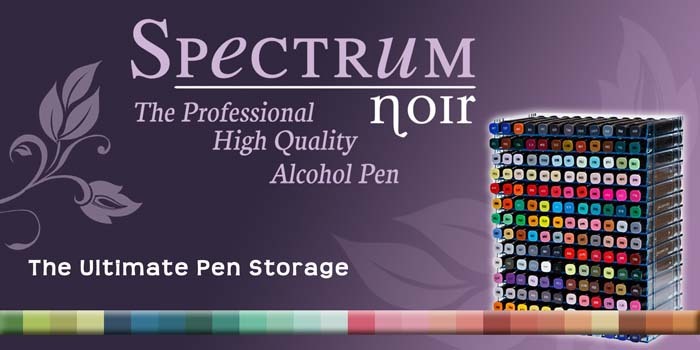 At Little Craft Shop we understand how important it is to make sure a product is right for you and so we have put together this page all about the Spectrum Noir range of pens/markers. 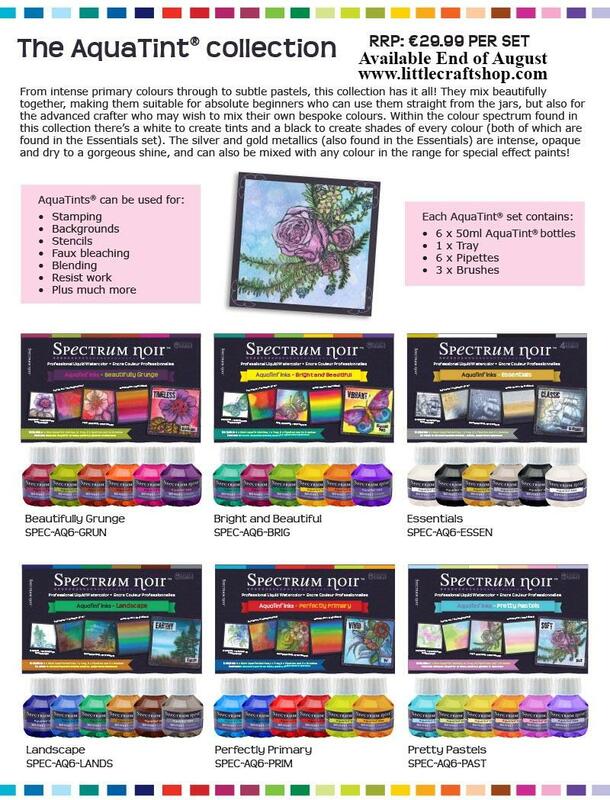 With tutorials, more information and reviews from other crafters that have used the Spectrum Noirs, we at Little Craft Shop want you to get the right information about every product we carry. 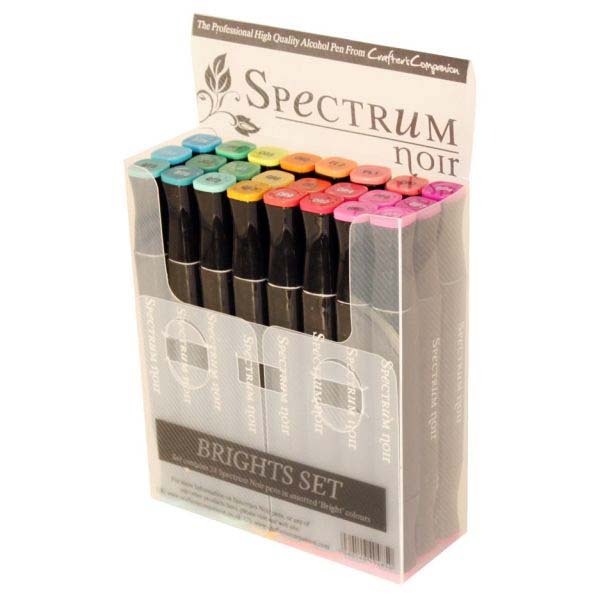 Spectrum Noir pens are a must have for any serious crafter who likes their colouring, especially rubber stamping enthusiasts! The markers are dual ended, fine nib and chisel ended, alcohol based, acid free and fast drying which means they won't bleed. Spectrum Noir marker pens are available in 168 colours which can be mixed on the surface, or layered over each other for professional blending. What makes Spectrum Noir Alcohol Makers so special? 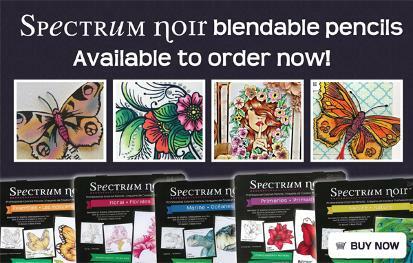 Spectrum Noir is the new alcohol ink based marker pen designed specifically for crafters. Each pen is double-ended, with a broad chisel nib for large area fills and a fine bullet tip for detailed work. The entire range of 168 alcohol marker colors is available in 16 different sets. There is no duplication of markers in any of them. The twelve sets of 6 markers make up the core line of colors and are packed in tonally matched color combinations along with an essentials pack that includes true black, a blender and 4 other commonly used colors. The first three markers in each pack (lighter tones) and the remaining three colors (darker tones) were chosen to blend well with each other to take the guesswork out of blending. The remaining four sets of 24 markers round out the color range and are sold in tonal packs; lights, brights, darks and pastels. As you take a closer look at the pen caps you will notice a number from 1 through 11. The number 1 represents the lightest shade of that particular color, while a number 11 would represent the darkest shade. Not all colors will have 11 shades, but the most important thing to keep in mind is that similar numbers will have a similar tone or shade. A #2 in blue for example will blend very well with a blue #3 or #4, but wont blend as well with a blue #8 for example. If you are trying to achieve an even tone in your project you may choose to stick with a #2 through #4 in each of the colors you choose to achieve a lighter tone overall. 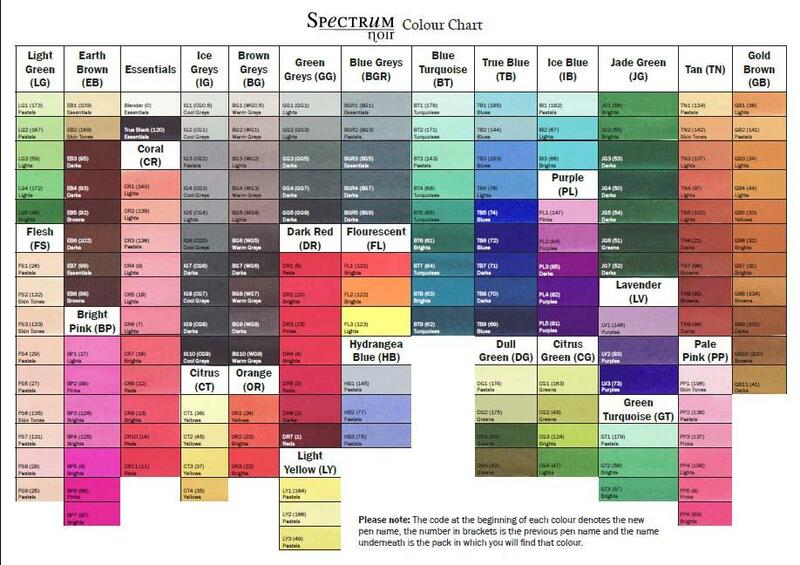 Spectrum Noir markers were created to be used long term. In other words, they are not disposable. Each marker can be refilled with the available 25ml refill bottles of ink and even the nibs can be replaced if they become dull or worn. This key feature makes our range of alcohol markers not only the lower cost alternative, but a wise investment in any crafters arsenal of products. Rounding out the line of our Spectrum Noir alcohol markers is our Ultra Smooth Premium White Cardstock. As with the use of any alcohol marker the paper or cardstock you use is as important as the markers themselves. Our cardstock features very tightly woven fibers that create an ultra-smooth surface perfect for color blending. The surface also inhibits the bleeding of ink that is common in looser woven fibered papers or textured surfaces. If youre looking for an affordable alcohol marker solution then youve found the answer!